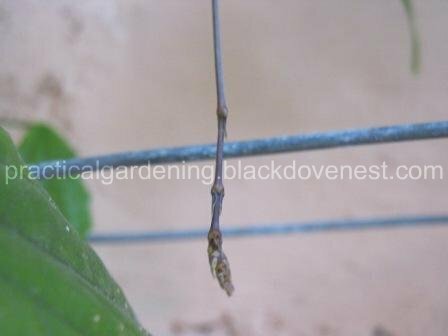 When I saw the Mysore Clock Vine's first raceme (elongated pendulous cluster of flowers), I was wondering as to when it actually started to appear. In fact, I didn't even know how it was supposed to look like. All I've been seeing in the Mysore Clock vine's almost 2 years of existence was its dense foliage - plenty of growing branches, shoots and leaves. 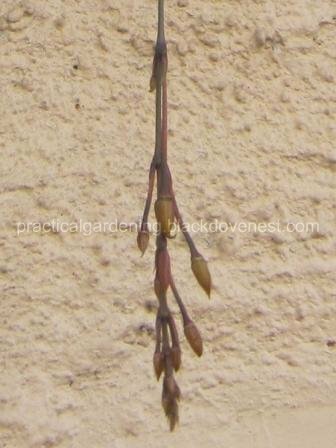 But after discovering the first raceme, I saw a curious thread-like growth two feet away along the trellis. The photo below was taken March 8. The thread-like growth turned out to be the peduncle of the raceme. It reminded me so much of the hanging threads of the Millionaire's vine. It was around 3 inches long, pinkish in color and was dangling straight down. 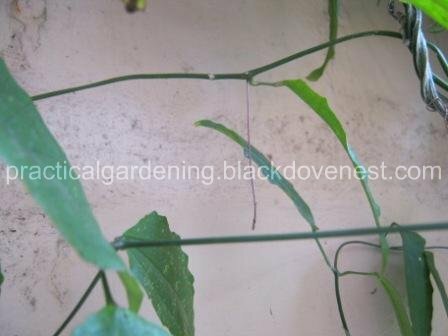 New shoots of the Thunbergia mysorensis, on the other hand, typically would come out from any angle. They then would eventually bend towards the horizontal and not dangle straight down. Also, unlike the usual new shoots of the Thunbergia Mysorensis, the peduncle didn't have leaf buds. Hence, I concluded that it was a new raceme. After a week (March 15), the red-brown juvenile bracts started to appear. See the photo below. 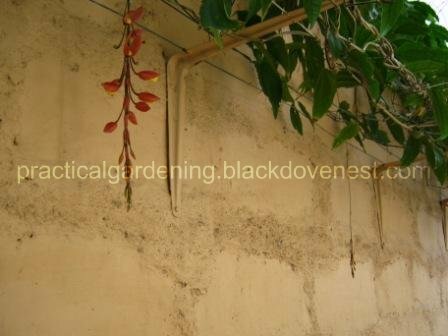 The peduncle is now 9 inches long and the young raceme has dangled just below the garden wire trellis. Note the color and shape. If you're not careful, you might mistake it for a dried up piece of twig. 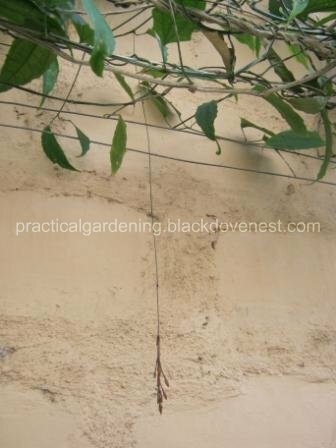 After 2 weeks (March 30), the Mysore Clock vine peduncle was already 17 inches long and was well below the garden trellis. In cooler places that have the mature vines, I've seen these thread-like growths that are more than a meter long! Here's a magnified view of the raceme. The pedicels connecting the bracts around the Thunbergia mysorensis rachis are still short. The rachis connects to the peduncle above it. If you look closely, you can definitely see the juvenile flower buds forming. There's nothing much noteworthy with the raceme's overall appearance. It even looks like a wilted plant from afar. It still had that dull reddish-brown color, although the calyxes comprising the bracts have a greenish hue to them. Compared to the first raceme of the Thunbergia Mysorensis, the second raceme dangled much lower because of the longer peduncle. The photo below shows the two racemes that are spaced two feet apart. The latter stage of the Thunbergia mysorensis flowering shows its full blooming. Hello Chandra. You may put your inquiries via comments in this website. I always respond to comments. Thanks for dropping by. Good day po! Almost a year na mysore ko hindi pa rin malago. Kamusta na po mysore nyo? Lumago pa rin? Hindi ko na naaasikaso yung mysore, pinuputol na lang kung lumalaki. Hello mam! Update ko po mysore ko. 1 year na pero hindi pa masyado lumalago. Mga 10ft long pa lang siguro. May nabalitaan ako somewhere sa sariaya quezon and lucban may tanim nyan sa lowland maraming bulaklak. Kamusta na po mysore nyo? Lumalago pa rin after trim? Baka doon sa lowland ay lumalamig. Yes, pero pinuputol lang. Mam ang tagal na ng mysore ko maybe pang 3 years na kumakapal lang hindi pa rin nagbloom. Expected ko sana sa march magbloom na. Yup, ganun talaga. Mabilis kumapal kaya't masipag ka rin dapat mag-putol. Matagal bago mag-bloom yan. Mam good day! Nagbloom na ang mysore ko. Tama ka hindi sya namulaklak ng inaasahan na ganon karami. Isa lang ang flower nya pero lucky ako kasi nagbloom. Maybe prunning ay makakatulong.ngayon na nagbloom sya hindi ko sya tatanggalin kasi sayang. Good. So mga 3 years nga bago mag-bloom, tama ba?